An MRI-compatible 12-lead ECG platform, equipped with MRI-gradient induced-voltage removal hardware and magneto-hydrodynamic voltage removal software , was previously applied to physiological monitoring and synchronization of cardiac imaging of patients inside MRI. This approach had limited success for high-duty-cycle [(total Gradient-ramp-time per R-R)/(R-R time) >20%] MRI sequences, such as Steady State Free Precession (SSFP), Short-TR Gradient Echo (GRE), and Short-TR Fast Spin Echo. 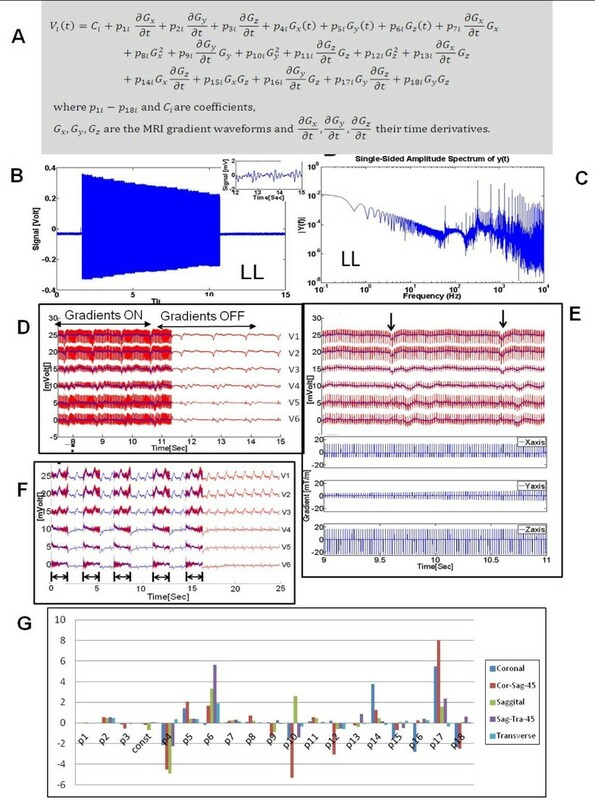 The study objective is to measure and develop a method to remove gradient-induced voltages on 12-lead ECGs during high-duty-cycle MRI sequences. A modification of the hardware developed in  enabled measuring the gradient-induced voltage over a 24 kHz frequency-range and +/-10V, together with the x, y, and z gradient waveforms. ECGs were measured in 9 volunteers at 3T (Siemens Skyra). A theoretical equation for the gradient-induced voltages on each ECG electrode (Vi, where i=1,2,3..9 was derived, based on Maxwell's equations  and concomitant fields  [Fig. 1A]. It includes 1st and 2nd order gradient waveform terms and estimates induced voltages even on ECG electrodes positioned farthest from magnet iso-center, such as the limb leads. (A) Theoretically derived 19-parameter equation for the gradient-induced voltage at each ECG Electrode (i). (B) Measured induced voltage at the Left Leg (LL) during and SSFP sequence (TR/TE=3.09/1.32ms). Magnitude is 0.7 Volts. Inset shows real ECG when MRI was not pulsing. (C) Frequency spectrum of induced-voltage on LL during SSFP sequence. Spectral peaks are at 60Hz and a harmonics of (1/TR) frequency ~320 Hz. (D) ECG traces V1-V6 recorded during a training GRE sequence (TR/TE=20/1.97ms), which consisted of intermittent imaging (Gradient ON) and non-imaging (Gradient OFF) segments. The non-imaging segment was then subtracted from the traces acquired during imaging ("corrupted ECGs", red lines), and the resulting traces fitted to the theoretical equation, in order to compute its coefficients P11- P18i and Ci. The calculated induced-voltages were then removed from the corrupted ECGs, resulting in restored ECGs (blue line) that were very similar to the true ECG. (E) Zoomed view of imaging-segment in (D), showing corrupted (red) and restored (blue lines) traces. Bottom Section showing gradient waveforms along x, y, and z directions recorded during this time. Black arrows highlight QRS complexes, which are easily observed in the restored traces. (F) during a full-resolution multi-slice SSFP sequences, the recorded ECG traces (red line) from 5 parallel slices were cleaned (blue line) in real-time using the equation, using coefficients calculated from a prior single-slice accelerated (training) sequence. (G) The 19-fit parameters for the V6 electrode for the same SSFP sequence acquired along multiple directions in a single volunteer; Coronal, 45 degrees oblique between Coronal and Sagittal, Sagittal, 45 degrees oblique between Sagittal and Transverse, Transverse. The 19 equation coefficients were obtained during 6-8 second training sequences, consisting of highly accelerated (3-4sec, GRAPPA=6-8) versions of each sequence, followed by non-imaging segments. The non-imaging segments were used to obtain the shape of the true ECG traces over the entire R-R cycle ("template"). This template was subtracted from ECG traces acquired during imaging, resulting in the net gradient-induced voltages, which was then fit to the equation, providing the 19 coefficients for each electrode. Multi-slice imaging was then performed, with real-time subtraction of the gradient-induced voltages from each acquired ECG trace, utilizing the computed Vi. Measured limb-lead ECG voltages during SSFP imaging, with the heart at iso-center (Fig. 1B), were 0.7-1.0 Volt PTP, with frequency components up to 20 KHz (Fig. 1C). Applying the equation for gradient-induced voltage removal during GRE (Fig. 1D-E), and multi-slice SSFP imaging (Fig. 1F), resulted in a normalized-difference between the recovered ECG trace and the true ECG of <20%. Equation coefficients varied by subject, sequence, sequence parameters, and slice orientation (Fig. 1G). An equation was derived for the strong gradient-induced voltages observed in 12-lead ECGs during high-duty-cycle MRI sequences. A rapid training sequence permitted computing equation-coefficients, followed by real-time gradient-induced voltage removal during imaging. NIH U41-RR019703, R03-EB013873-01A1, AHA 10SDG261039.